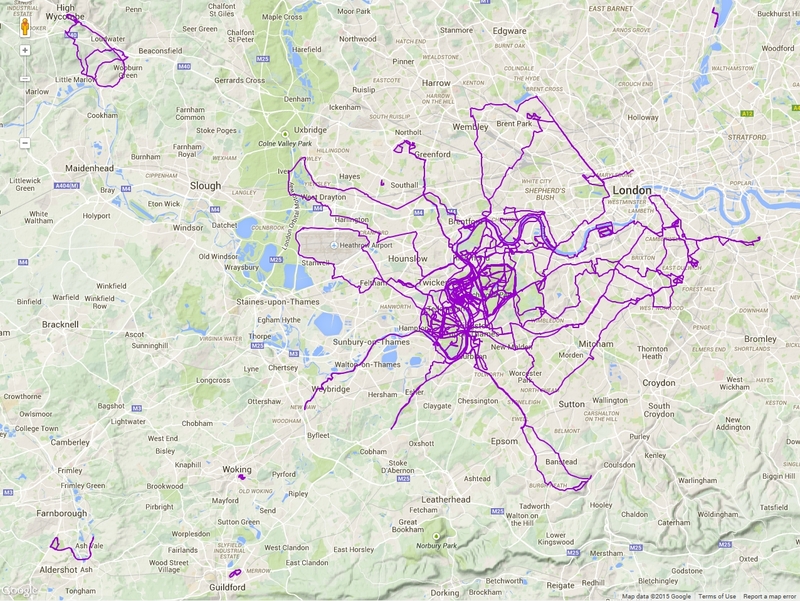 I’m a long distance race walker from New Zealand, living in London, and in this blog I write about my adventures as I walk the streets of London. 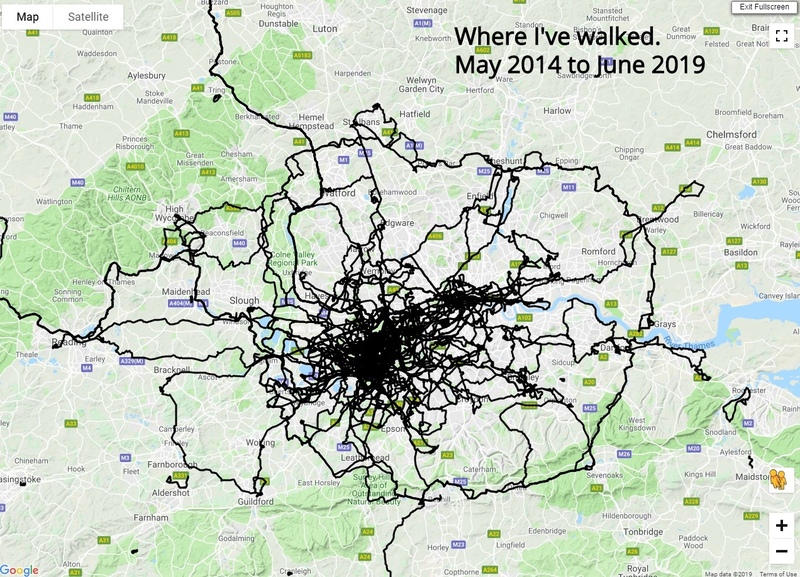 This map shows where I walked since moving back to London in 2014. Most of my training walks are relatively short and local to home (Kingston Upon Thames) but some walks range up to 50 miles and my focus when it comes to racing is events of 100 miles or more – in 2016 my goal is to break the current NZ records for 100 miles and for the greatest distance walked in 6 days. I started race-walking in 2012 due to a running injury and haven’t looked back. 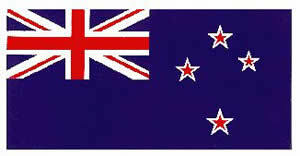 I did my first 100 mile/24 hour race in Auckland, NZ in October 2013 qualifying as NZ Centurion number 19, and then qualified as UK Centurion number 1131 in August of 2014. 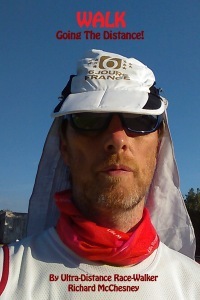 In 2015 I broke the New Zealand records for the greatest distance walked in 48 hours and for 200km in two separate races, and also competed against runners in the Thames Path 100 mile race from Richmond to Oxford along the River Thames in May, and the Grand Union Canal Race (145 miles) from Birmingham to London three weeks later. I’m regularly taking photos when out walking and this blog is where I share those photos as well as writing about some of the sites I see and the training I am doing. Follow me on facebook and/or twitter to be notified when I post updates on this blog. Also, please visit my charity page to find out about my next charity fundraising walk. Diana and I were the tail runners/walkers at today’s (Maidstone) parkrun. It was fascinating to hear of your amazing efforts. Hope the injury heals soon. It was a pleasure to meet you. Thanks Sue. Nice to meet Diana and yourself too. We met in Richmond Park this morning at Kingston Gate. Read your report about the Thames 100 and, knowing a fellow park-runner who did it last year, I’ve a lot of admiration for anyone who even attempts such an event. Will keep my eyes open for you in the future…. Best of luck in the Grand Union Canal event. Thanks for mentioning me in dispatches and a photo too! You helped keep me going in the early part of the TP100 and I actually got halfway, missing the cutoff at Henley (51 miles) by 10-15 minutes (hence no time shown on results). I guessed I would be timed out after I left Hurley but I’ve promised myself not to give up until I get pulled out. Got lost a couple of times with the sweeper! I felt fine at Henley, so I might have been able to make up a bit of time, but hey it’s over now. Trying NDW50 this weekend. I’ve completed it before but the cutoff time is 30 mins less now, 13 hours. Still, it’s good training. Best of luck with GUCR. I’m sure you will make it. Just pace yourself and don’t give up when you are feeling low. Good luck for the NDW50.